Turner Classic Movies has posted the online preview of its November schedule! 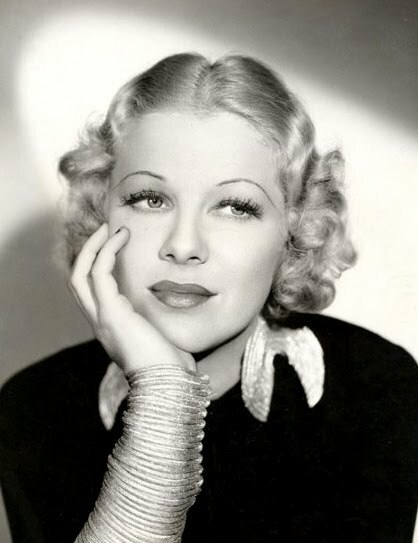 In a move which is sure to please her many fans, Glenda Farrell has been chosen by TCM as the November Star of the Month. Four dozen films in which Farrell appeared will be shown on Mondays in November, starting in the daytime hours and continuing into prime time. The October Noir Alley movies are THE SNIPER (1952), THE THREAT (1949), THE WOMAN IN THE WINDOW (1944), and THE KILLING (1956). Saturday morning programming will feature Whip Wilson Westerns, along with continuing Popeye cartoons and the Saint mystery series from October. Joel McCrea will receive an eight-film daytime tribute on November 6th, the day after his birthday. 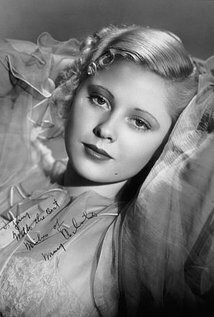 The late Mary Carlisle (pictured at right), who recently died at the age of 104, will receive a primetime tribute on November 15th. Also honored with multifilm tributes in November: George Sanders, Eleanor Powell, Mark Sandrich, Jane Russell, Will Geer, and the Sherman Brothers. November themes will include pioneering women filmmakers, cattle drives, Veterans Day, and films with "wild" in the title. Thanksgiving features a great lineup of family-friendly films including Universal's MA AND PA KETTLE (1949). The TCM Spotlight is titled "The Art of Casting." I'll have a more detailed look at TCM in November posted here around Halloween. In the meantime, Dean Martin continues as the current Star of the Month for September, and Rita Hayworth's centennial will be celebrated when she is the Star of the Month in October. Update: For more on TCM in November 2018, please visit TCM in November: Highlights and TCM Star of the Month: Glenda Farrell. It is lovely that both Glenda and Mary will be celebrated.